Authors: Andrew Vanderburg, John Asher Johnson, Saul Rappaport et al. First Author’s Institution: Harvard-Smithsonian Center for Astrophysics, Cambridge, MA 02138 USA. In around five billion years, the hydrogen fuel in the core of the Sun will run out, and our star will begin to die. After swelling up into a red giant, many times bigger than its current size, the Sun will blow away its outer layers to leave a tiny, ultra-dense core, around the size of the Earth. White dwarfs, as these dead, slowly cooling star cores are known, are the ultimate fate for the vast majority of stars in the Universe. White dwarfs are incredibly dense, with surface gravities a million times higher than the Earth. This means that any heavy elements in their atmosphere should sink deep into the white dwarf, leaving a thin layer of pure hydrogen or helium. But between quarter and a half of white dwarfs have been found to have heavy elements in their atmospheres, along with discs of gas and dust in orbit. The leading explanation for this among astronomers working on these systems (including this astrobiter!) is that the white dwarf is being polluted by rocky debris, left over from dead star’s old planetary system. The missing link in this scenario has been direct observation of such debris, before it reaches the white dwarf. The authors of today’s paper claim to have finally found some, using NASA’s Kepler spacecraft. Figure 2 from Vanderburg et al. 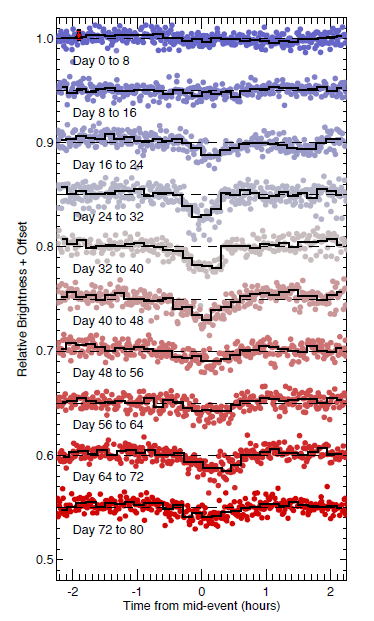 : Kepler light curve of WD 1145+017. As the suspected small planet or asteroid passes in front of the white dwarf, it blocks some of its light, causing the dips in the middle of the curves. The irregular shape of the dips suggest that this planet is no longer intact, and is surrounded by a cloud of debris. Kepler is a space telescope, designed to constantly watch thousands of stars for the slight drops of light caused by a planet moving across a star. Since a malfunction ended its ability to stare indefinitely at a single patch of sky, Kepler has been sailing on sunlight. The slight pressure from the light allows it to keep pointing in one direction for around 80 days at a time. Although this means that planets with years-long orbital periods are now beyond Kepler’s reach, the number and variety of the stars it looks at has vastly increased. It was in the first of these 80 day fields that Vanderburg et al. spotted a strange signal, coming from a white dwarf known as WD 1145+017. The light from the white dwarf was periodically dipping every 4.5 hours, exactly the signal expected from a transiting planet. But the transits had very strange, irregular shapes, quite unlike the smooth dip a planet would cause, and were about five times longer that expected. However, they were exactly the signal you would expect from a small planet surrounded by a cloud of debris. There were also five more, weaker signals, with periods ranging from 4.5 to 5 hours. To confirm this hypotheses, the authors took more observations with ground-based telescopes. New light curves showed that the signals were there, but weren’t quite where the Kepler data had predicted, out by up to half an orbit. Nevertheless, they proved that the dips in light really were transiting debris, as the shape of the light curves could not have been produced by other effects, such as activity on the white dwarf itself. Direct imaging and spectroscopic observations ruled out the presence of larger planets, which might have made the same signal. The spectra also revealed that the white dwarf’s atmosphere is polluted by a plethora of heavy elements, such as iron, silicon and magnesium. In other words, exactly what you would expect if WD 1145+017 was accreting the debris of a disintegrating planet. The physics checks out as well: the authors show that six objects can be stable in the roughly 4.5 hour orbits seen for hundreds of years, as long as they’re no bigger than the asteroid Ceres. 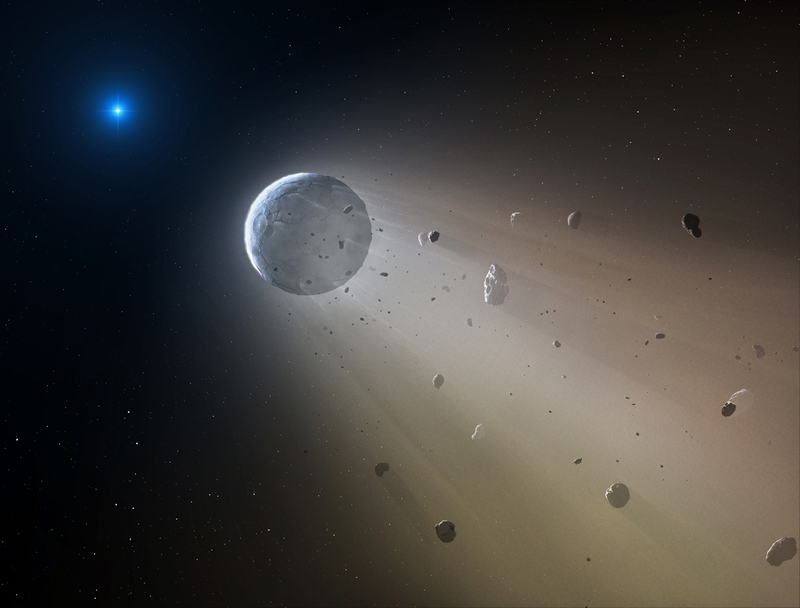 The heat from the white dwarf is easily enough to blast rock off the surface of an asteroid that close, at a rate of around eight thousand tons a second. Although there are many unanswered questions about this system, the authors conclude that they have indeed seen asteroids and small planets, surrounded by clouds of debris, in orbit of WD 1145+017. The paper finishes by saying that this scenario is entirely consistent with that built up, over many decades, of the remnant planetary systems around white dwarfs (and on a personal note, it’s nice to finally know that the basic premise of my PhD is correct!). Kepler will soon observe many more white dwarfs, so hopefully this is only the start of the discoveries it will make, and the insights it will provide about the death of planets.